I love a parade! Do you? Did you watch the Rose Parade 2014? 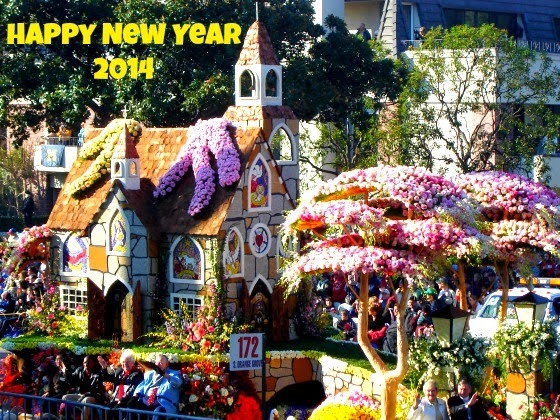 This picture was taken of a float in an annual New Year's Rose Parade in Pasadena, California. The Rose Parade was an item on my bucket list that is now in the "done" column. The flowers were breathtaking! I definitely recommend seeing the parade in person. The Macy's Thanksgiving Day Parade in New York City is also in the "done" column of my bucket list. I also saw the St. Patrick's Day Parade in NYC. I've seen all the parades in Disney World. I just love a good parade. I remember the parades but I don't remember the year I saw them. The dates really don't matter. I know I saw the parades. I have the memories of the days, the great feelings of seeing the parades and I even have some pictures. So the dates don't matter. I don't remember the date I accepted Jesus as my Savior either. Do you? The date doesn't matter. I have the memories of the day and the overwhelming feeling of the Holy Spirit every day. I KNOW it happened! John 19:30 says "When Jesus therefore had received the vinegar, he said, It is finished: and he bowed his head, and gave up the ghost." He died for our forgiveness. Accepting Christ is the most important item on the bucket list in 2014. Check it off! Please! Seek him and he will answer. Make two.zero.one.four the year to open the door to Jesus. If you can move this to the "done" column, you can joyously say "It is finished". I guarantee, salvation is an experience to remember...HAPPY NEW YEAR 2014! Leave me a comment with a few of your bucket items for 2014. The only one I have is to find a successful work from home job so my husband can retire! Got any ideas?